We've provided a powerful 5" x 24" hydraulic cylinder for digging and lifting. 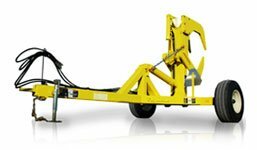 The cradle arms have an independent 3" x 16" hydraulic cylinder for grabbing which holds the rock in transport. This means large horsepower tractors are unnecessary as the RD320 has ample hydraulic strength for digging.